Working with Chart Object in VBA is a complicated matter, but interesting too. Once the code is developed it is very useful and can be used across Applications to prepare Graph Charts with the same look and feel in minutes. There are several Chart Types, Chart Areas and numerous Object Groups and Objects to work with. The Range of values that can go into them, are too many. There are Chart Type specific properties and value-ranges, like the Auto Scaling property that can be used only for 3D Charts. I did some searching, experimenting and created a VBA Routine that can modify the Graph Chart elements with beautiful formatting to my liking. I hope you will like it too. The sample run result image is given below. Resizing of Graph Chart and formatting of several elements, like Chart Title, Axis Titles, Chart Area, Plot Area and Chart Bars with Gradient color, Legends, Grid Lines, Data Labels and alignment of Data Labels are done with VBA Code. Placing a Chart Object on the Report with few property changes, as a starter kit, are done manually. The same Graph Chart is transformed into any one of these Types and the sample values from a Table is used for all the three. Pie-Chart will only use the first record from the Table and the treatment of values in a pie-chart is different from Bar Chart or Line Chart. Here, it is used only for example purposes and Pie-chart is not treated separately. 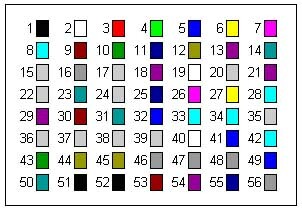 The following Color index numbers can be used in different combination in Program to get different shades of gradients. Follow the few simple steps explained below to get prepared for the trial run. Create a Table with the following Structure and save it with the name Table1. Add the sample records with the values shown above. Select Object. . . from Insert Menu and select Microsoft Graph 2000 Chart (or Microsoft Graph Chart in MS-Access 2003) from the Object Type List. The inserted chart object with default values will be in an activated state, displaying the default values in the Data Grid. Click outside the chart on the Detail Section of the Report to de-activate and de-select the Chart. Click on the Chart again to select it and display the Property Sheet (View - - >Properties). Chart Area where Chart Title, Axis Titles and Legend Values appears. Plot Area where the chart Data Series Values, Data Labels, Gridlines, Scale and Category Values appear in Bar or Line Charts. If the SizeMode property set to Clip (value 0) then resizing the Chart with the last four values (Left, Top, Width & Height given above) will only change the size of the outer Frame. The inner Sections Chart Area and Plot Area will not resize with the change. If it is set to Stretch or Zoom(Values 1 or 3 respectively) then they will resize to fit within the outer frame area. Zoom is a better setting because it will maintain the Chart in the correct proportions when re-sized, without distortion. The Column count property value is found from the Row Source Table or Query String. We are validating the settings in Row Source Type property. If it is not set with the value Table/Query then it will change to that value. But, if the Row Source property is not set with a Table Name or valid SQL String then the program will terminate with a message. Save the Report with the Name myReport1. Copy and Paste the following VBA Code into the Global Module and save the Module. msg = "1. Bar Chart" & crmsg = msg & "2. Line Chart" & crmsg = msg & "3. Pie Chart" & crmsg = msg & "4. Quit" & crmsg = msg & "Select Type 1,2 or 3"
MsgBox "RowSource value not set." 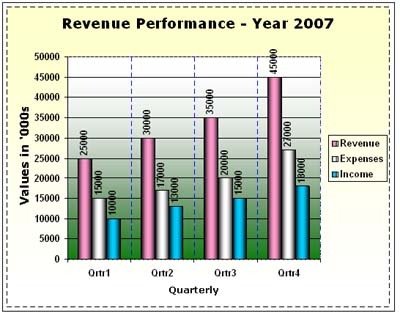 .ChartTitle.Text = "Revenue Performance - Year 2007"
.Caption = "Values in '000s"
Open the VBA Module that you have pasted the Code, if you have closed it. 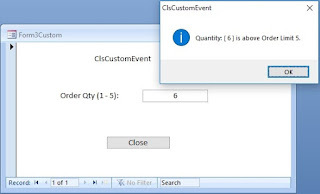 Or call the function from On_Click() Event Procedure of a Command Button on a Form. 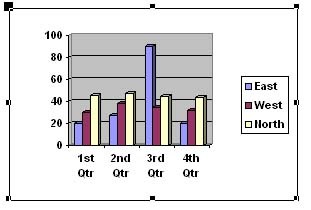 Select the Chart Type 1, 2 or 3 for Bar Chart, Line Chart or Pie respectively. The Program will open the Report myReport1 in Design View, modifies the Graph Chart for the selected Type, Saves it and then Re-opens it in Print Preview. You may minimize the VBA Window (Alt+F11) to view the Chart. Since, the Report is saved after the changes, you may open it manually in design view or Print Preview. When you run the Code for Bar Chart or Line Chart, the Gradient Scheme Color Codes are selected Randomly, which will give different shades of Gradient Colors every time. NB: Any suggestions for improvement are welcome. I'm receiving a compile error "Expected variable or procedure, not project" that highlights "Reports" from the following that I copied/edited in my database (I have MS Access 2003). What am I missing? Do you know why I am receiving this error? Ensure that you have not given the Global Module Name same as your Database, which I think it is now. The Procedure Name also should not have conflict with these names. You have to make change in one more of these values. Check the Project Name (which will be same as of your database name) and change it to something else than the Module Name. After changes re-compile the Code and Run the Program. Thanks so much. That worked! I get a compile error on msoGradientVertical and msoGradientHorizontal. One other example I saw used the Points object with these constants, not SeriesCollection object. Attach Microsoft Office Library File to your Project. Open any VBA Module. Select Tools - -> References and put a check mark on Microsoft Office 9.0 Library or equalent Version available on your machine. Refer the Post: http://www.msaccesstips.com/2006/09/command-button-animation/ for more details of attaching a Library File to your Project. I am using Access 2007. I have tried everything I can think of, but must be missing something simple. Enlightenment would be much appreciated! A sample database with the Chart Object examples will be prepared and added to the Download section shortly. You may download it. If you can leave your email address I shall forward a copy to you when it is ready. I am getting Type mismatch error when I try this and no changes appear to be made to the pie chart?